Hear us, oh infernal master. Through you all will come to pass. God of flesh and deep desires. Make us one with darkness. Magick shall be our key, prayers said unto thee. "The gate is closed yet the flame burns from within. Vessels for satan's power made up of lust and sin. Open the mysteries of your creation. 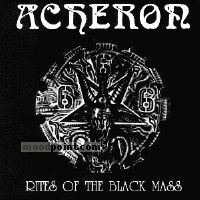 Make us partakers of undefiled wisdom...."
if you want to see other song lyrics from "Rites Of The Black Mass" album, click "Acheron Singer" and search album songs from the artist page. If you know some new information about ONE WITH DARKNESS, or other song from our site, that isn’t already on song page, please let us know, Any refinement, news, or comment is appreciated. If information about ONE WITH DARKNESS, or any song from moodpoint directory is wrong, please contact us and write where the incorrect data should be replaced by correct data. Use "Find Lyrics" box on our site, try to use different artist or (and) song title(ex: ONE WITH DARKNESS) word forms.